So this past weekend I commuted to Expressive Glass in Buffalo to take a class on paperweights with David Graeber. I had a great time and learned lots, so I thought I would share a few pictures with you. 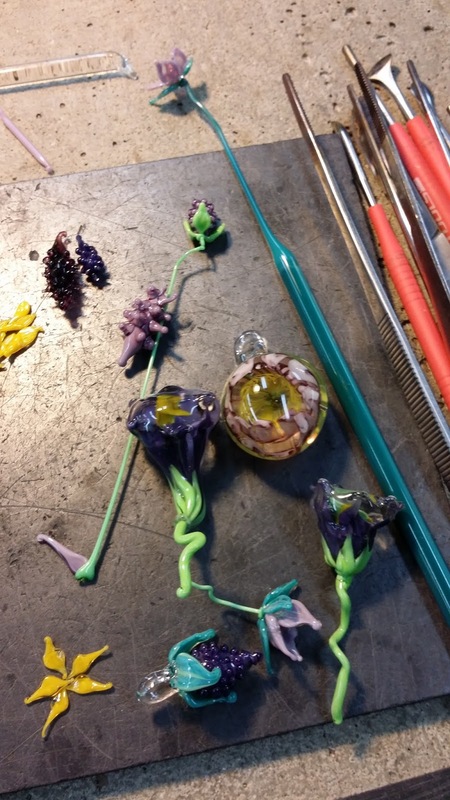 Each flower in the paperweight is created off mandrel in advance. It's crazy how tiny they need to be to fit in the paperweight. 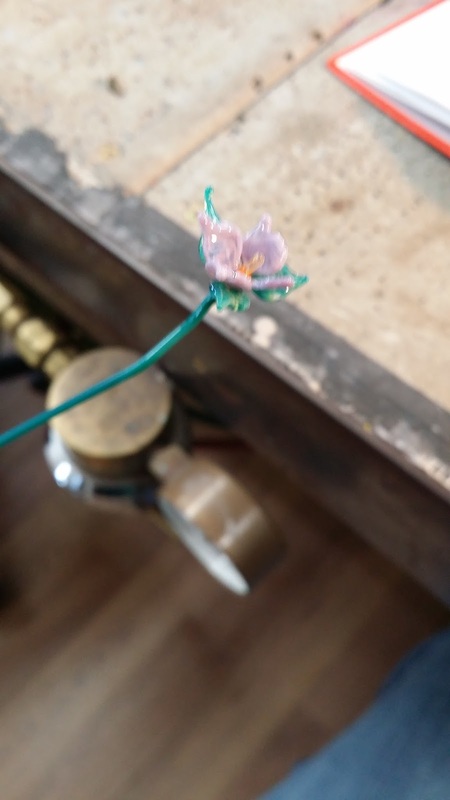 You can see in the picture above the tiny pinpoint flame he's using to create the rose in the below picture. The other thing that I really liked is how in sculpting these, he only used his torch and a pair of tweezers. 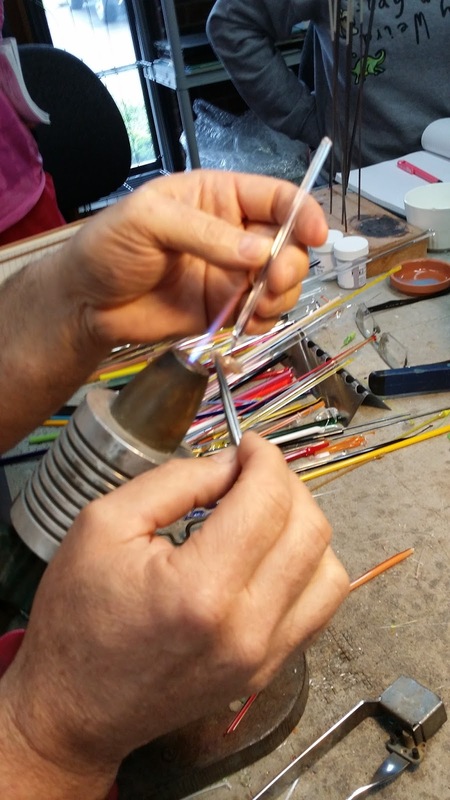 Tools are wonderful, but it's nice to have the ability to create something with just the glass and the flame. Below are all my components from day one. They are about how you expect class work to be, not sell-able or even that great, but a learning process. I actually really liked working so small because there was very little worries about thermal shock. Being the frugal glassworker I am, I also liked not needing too much investment in materials. 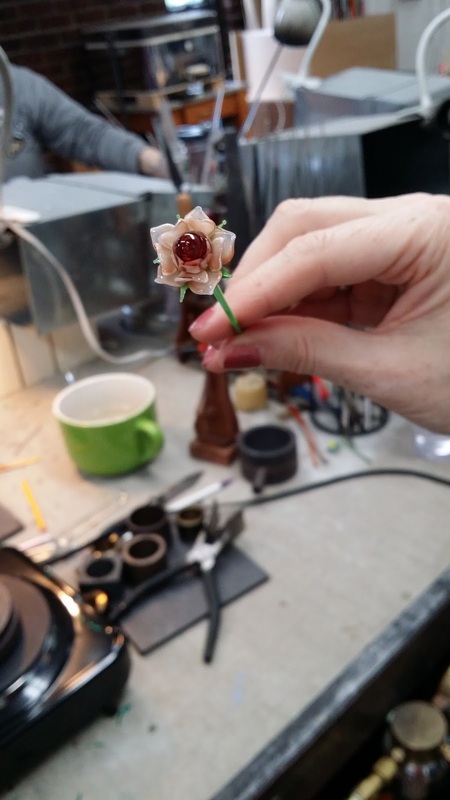 My first components were still waaaay too big to fit in the small paperweights we were making in class, but practice makes perfect (or at least good enough) as seen in my day two picture below. I even managed to make a tiny kitty. It just wouldn't be my work without a cat of some sort included. 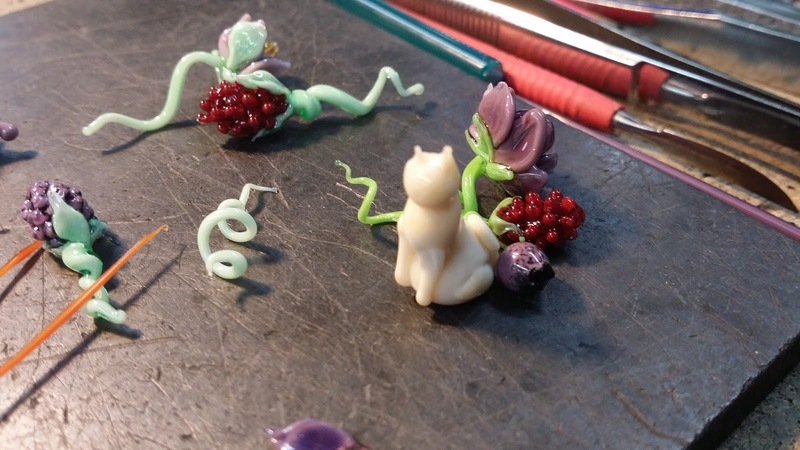 The grouping of the cat, blueberry, rasberries and flower ended up going in my paperweight. I wish I had a picture, but that will have to wait for another time as it went immediately into the kiln and it will be shipped to me in a few days. Will I be making paperweights? Probably not any time soon, but I might try making some tiny flowers to add to my beads. I am going to try to build a tiny vacuum encasement setup to maybe play with marbles or decorative scenes in the future. We'll see.